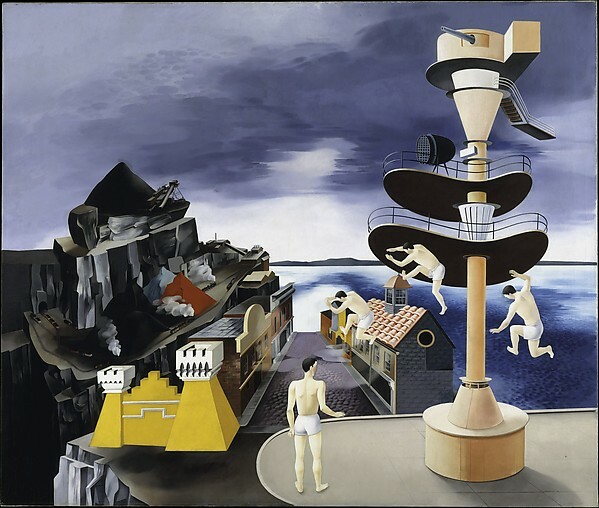 Peter Blume’s Study for 'South of Scranton' (1930) for the Museum’s permanent collection. Blume was one of the most famous and important American painters in the 1930s. 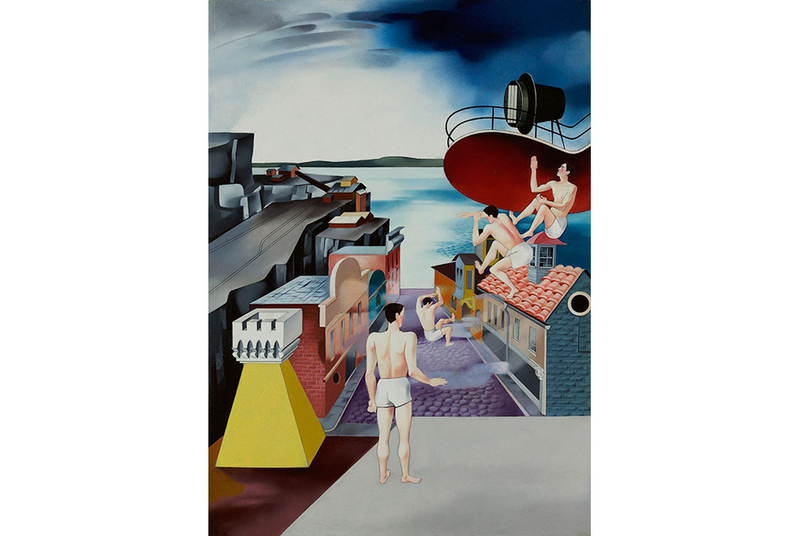 His style was similar to the Precisionists like Charles Sheeler, but Blume was in fact one of the first American artists to understand and practice Surrealism. One of Blume’s most significant works, Study for 'South of Scranton' was inspired by a road trip the artist took with his wife. They traveled south from their home in Connecticut through the coal fields and steel mills of Pennsylvania until finally stopping in Charleston, South Carolina, where Blume saw sailors performing calisthenics aboard a docked German naval ship. When he returned to work, he used the Surrealist method of free association to merge the images he had seen while traveling. On the left side of Study for ‘South of Scranton’, gray quarries and heavy machinery form a bleak industrial landscape. The rest of the painting contains picturesque Charleston streets, acrobatic figures leaping through the air, and a ship deck over the ocean. The second and final version of this subject is in the collection of the Metropolitan Museum of Art and was awarded First Prize at the Carnegie International in 1934. Both this work and Study for 'South of Scranton' were included in a 2014 retrospective of Blume’s paintings at the Pennsylvania Academy of Fine Art. During his career, Blume won major awards from the Metropolitan Museum of Art and the Guggenheim Museum, and his works were collected by the Metropolitan Museum, the Museum of Modern Art, the Whitney Museum of American Art, and the Art Institute of Chicago.